Looking for a Leather Motorcycle Vests? Extreme Biker has Upstate NY’s biggest selection of MC club vests. We assist our customers by making sure the vest fits with or without a jacket. 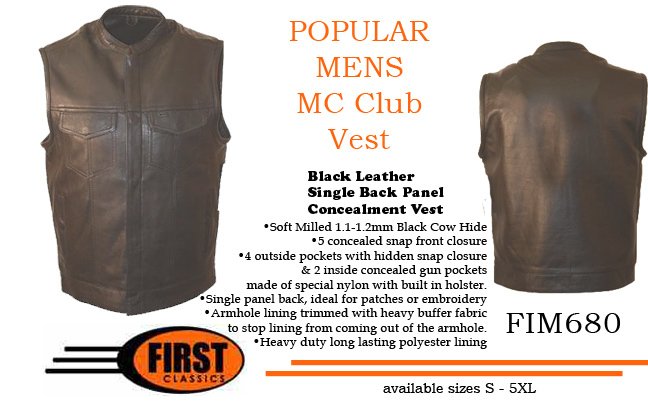 EBL carries an assortment of vests from classic button-Up biker vests, side laced 10 pocket vests, western style mc vests, classic MC vests to street bike vests. We have over 9 solid back panel vests for just about every club. Check out the ones with concealed gun pockets. Extreme Biker Leather is sure to have the riding vest you need at affordable prices. Note when ordering vests - most have big arm openings for usage over MC jackets - especially Club vests.